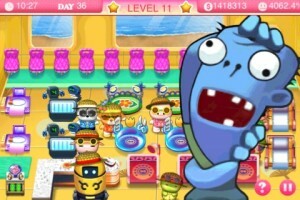 Home News August 21: Zombies for Download in Pretty Pet Salon Summer! August 21: Zombies for Download in Pretty Pet Salon Summer! Pretty Pet Salon Summer is getting an unexpected visitor! There’s a zombie in town, and soon he’ll be banging on your door. And he isn’t here for your brains! Instead, he comes with a pet of his own, and you need to pamper it just like all the rest! On August 21, 2011 (Eastern Standard Time), you’ll get a rare chance to download this new VIP customer in Pretty Pet Salon Summer. Visit the Downloadable Content page by tapping on the “Download New Levels” button on the main menu screen, and there you’ll see the zombie waiting for you to let him in. Don’t be fooled by his looks – treat his pet with VIP service and he’ll pay you really well! This funny-looking customer will be up for download on August 21, 2011 (EST), for 24 hours only. This is one zombie you’ll definitely want invading your pet salon!